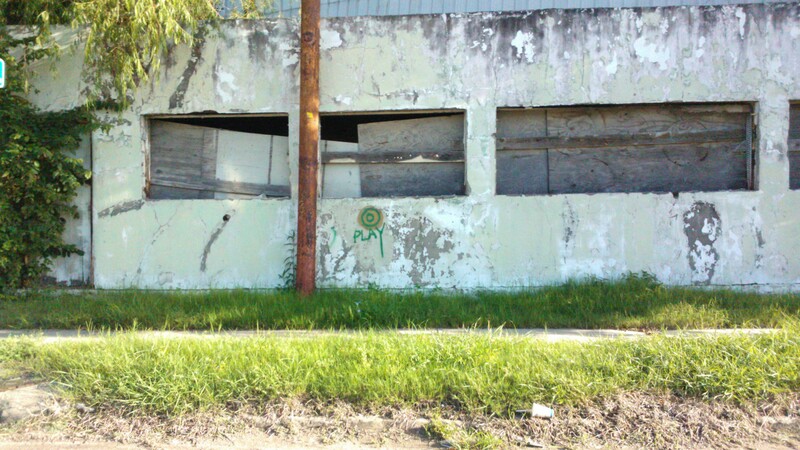 I liked this photo and wanted to try out different sharing options. I don’t really like Facebook’s photo resolutions they share it as so I want more options. I just wanted to test something out. I’m reading a couple of blog posts about the inevitable demise of Windows Live Writer, which is a great blog app that Microsoft gives away for free, and the eventual replacement with Word (probably when 2013 is released). I just installed Word 2013 at home on my Windows slate. I’ll repeat this test on it later so I can compare the versions. I’m blogging from my phone. Here’s a burger I ate. Reject SOPA, the “Stop Online Piracy Act”. It’s a heavy handed attempt which gives the government wide powers to shut down websites and over-burden site owners. It will have wide and dramatic impact on the sites you visit day after day. …Just like most reactionary things Congress seems to do, this will have little to NO IMPACT against true criminals who are pirating movies and music. Visit this site to quickly find contact info for your Representatives and Senators. It will give you a quick message you can use to call or, as I choose to do, email them from their website. Go to the Electronic Frontier Foundation website and input your Zip Code. This will return your Representative’s name and phone/fax number. If you like talking on the phone, you’re almost done. But I like to email them. 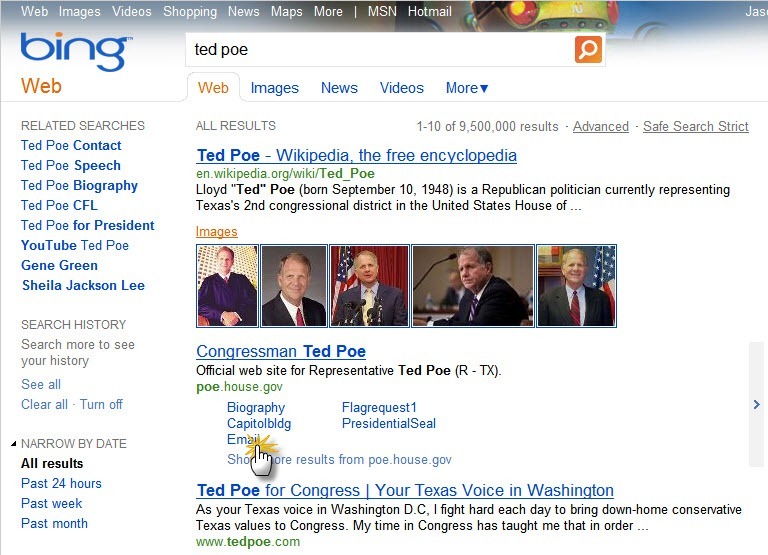 Open up a new browser tab and search for your representative’s names. 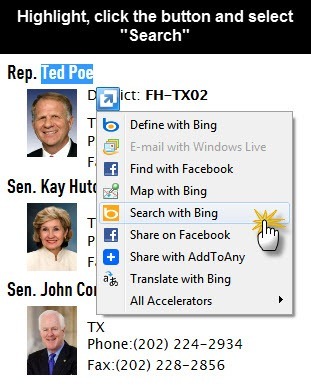 Bing actually gave me a few helper shortcuts to get right to the “Email” section of my representative’s website so I clicked right on that. Your mileage may vary. Fill out the forms required to show your constituency proof and then you’ll get the form where you can type your message. Go back to the EFF tab and you can copy the Subject line and Message body they provided. Go back to your tab with the Congressman’s Email Form and paste that into the respective fields. Hit Submit and you’re done! Thanks for your time. If you’re reading this at work and it’s really quiet because it’s the last day of the year and there’s nothing going on – why not take a break from Facebook and YouTube and let your Congressmen and women know that you have an opinion and it matters. Here are link links for my Texas visitors. Users started reporting an error this morning when they attempted to open an Excel spreadsheet or other office file in their personal document libraries on their My Site. The error basically says that the operation failed and to try again later. What’s happening is that Office Web Applications (“OWA”) have been enabled on their site collections (each users’ My Site is their own personal site collection). UPDATE: Close – the Office Web viewers are the default viewer for Office files in a SharePoint 2010 installation. In discussing this with a former coworker and our 2010 upgrade procedure document I was reminded that one of the steps we took during our upgrade was to go into our main Site Collections and make the change below for each one. Well, not each one – we didn’t make the change on the 4600 My Site Site Collections. Then scroll down and select “Site Settings”. 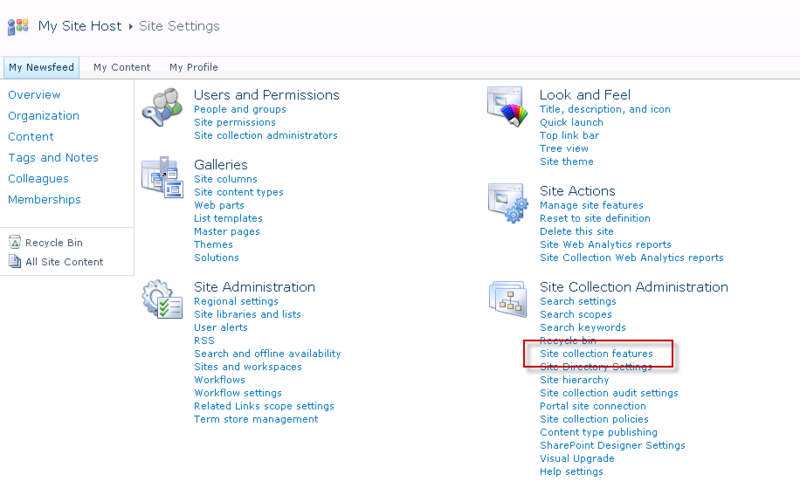 Click “Site collection features” which is located in the right hand column under the “Site Collection Administration” heading. A list of features will appear- each with a corresponding “Activate” or “Deactivate” button. Don’t get too click happy here but scroll down to the “Open Documents in Client Applications by Default” and click “Activate”. You’ll know it worked when the Activate button changes to Deactivate and the blue “Active” label is added. Now test opening your Office document and it should work as desired. UPDATE: I’m now looking for a way to automate this change on everyone’s My Sites. Your feedback is welcome. I will update this post with that information when I find it. Okay, the delay in getting this episode lies fully on me, Jason, for my delay in producing and whatnot. It’s been busy at work and all that malarkey but here you go – Episode 5. I’m going to try and do show notes for you this episode and going forward. We’ll see. Note to self – we teased some ideas for future episodes; if I don’t write them down here we’ll forever forget them so forgive me. Thanks for downloading. We welcome your comments. I’ve changed the URL of this site and would recommend that you change any subscriptions you have to this site and the 2.5 White Guys podcast. Sorry for the inconvenience but it’s good to do this now before we get totally famous and are podcasting for a living. Also, I’ll be using that money to feed my pet unicorns. Oh, the feed is at the right of the page over there.